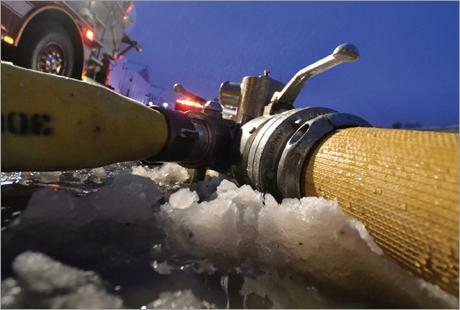 Superior efficiency on the fireground – delivering more GPM with lowest friction loss. Nitrile rubber cover greatly increases abrasion resistance, provides long service life. Smooth inner liner reduces friction loss to a minimum. Compact and flexible for improved packability. Available in 3”, 4”, 5” and 6” diameter supply lines. 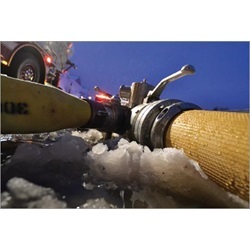 Angus Hi-Vol is a tough large diameter hose with the ability to deliver more water at a lower cost. But it doesn’t stop there. It is lightweight, compact and durable with a high resistance to oils, chemicals, ozone and heat. Its tough, high tensile cover and lining, permanently interlocked with the synthetic reinforcement, provide greater abrasion resistance while being snag-proof, kink resistant, and immune to mildew or not. U.L. labeling is available on 4” (200 PSI) and 5”. The standard colors for Hi-Vol are yellow and red (6” not available in red).